Last week (22nd-25th June), ELIXIR-NL Training organised and hosted both a Data Carpentry hackaton and a workshop at the University Medical Center Utrecht (UMCU). The events were co-organised by UMC Utrecht, Netherlands eScience center (NLeSC) and ELIXIR-NL. Both events are a part of a ELIXIR Pilot project aiming to develop Data and Software carpentry training across ELIXIR nodes. The project is coordinated by ELIXIR UK and a number of other nodes are partnering up, including ELIXIR Netherlands, ELIXIR Finland and ELIXIR Switzerland. Group 1 worked on creating training materials on using ELIXIR Cloud resources. Group 2 worked on a decision tree for cloud computing. Group 3 worked on different aspects of understanding how to use one’s data for genomics. In particular the group worked on describing the file formats, file manipulation, pipelines integration, post-assembly – de novo RNA Transcriptome Analysis, handling blast annotation output and verifying data. Karthik Ram (University of Berkeley, rOpenSci, Data Carpentry) and Aleksandra Pawlik (University of Manchester, Software Sustainability Institute) facilitated the hackathon and led the 2-day Data carpentry workshop that followed the hackathon. 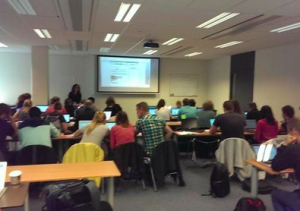 30 life science research students attended this first Data carpentry workshop in Netherlands. It covered the standard Data Carpentry curriculum. However, one module covering using ELIXIR Cloud resources was added at the end of the second day. These training materials were developed during the hackathon. The whole event received positive feedback. In general, this pilot project appears to receive a great reception within ELIXIR. The Slovenian and Belgian nodes are running workshops this year and it is likely that others will follow soon. This entry was posted in ELIXIR, Learning.